Sale Extended! 15% Off On Any Size Order! Home>Sale Extended! 15% Off On Any Size Order! Ground Up has never offered a sale like this before. All individual items in our online store will be eligible for savings! Use coupon code GET15* to get 15% Off on all qualifying orders! No minimun required! This promotion is for orders placed online only. Our Ground Up Exclusive kits and clearance items are already discounted up to 40% so the coupon won’t apply to these but everything else on the site will be eligible* for 15% off! See restrictions below for additional details. FREESHIP coupon code does not have an expiration date! GET15 expires on 04-17-18 at 4:00pm est. *For 15% offer to apply the order total must be $0.01 or greater. 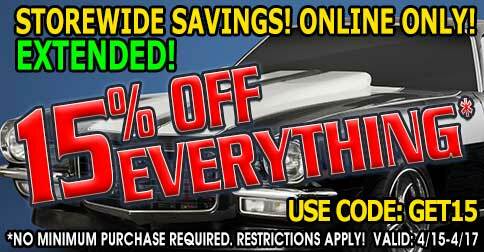 15% off coupon only applies to items marked as Part eligible for discounting: Yes (Discounting information can be found on the product description page for all parts). If your basket contains a mixture of items marked as both Yes and No for eligible for discounting your order total will be reduced to reflect any items set to Yes for “Part eligible for discounting: Yes”.